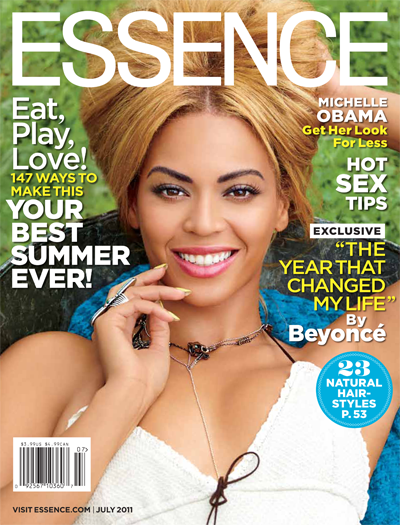 Beyonce is the cover girl for the July edition of Essence Magazine. Listen, I love Beyonce. She's a very talented woman who has a penchant for turning nursery rhyme type songs into mega hits. She is very beautiful, she has a work ethic unlike anyone else in the game (accept maybe GaGa), and again she is uber talented, but dang is she the only person that Essence can put on the cover outside of Queen Latifah, Jada Pinkett Smith, and lord don't let me forget Mary J. Blige or Nia Long. It's like Essence is seriously recycling covers. I realize Bey has an album to promote, but can someone else get some shine? Is that really asking too much? Essence is pure trash!! They have lost their mojo..Every month recycling celebs we've seen a million times. What happened to letting other black women who have accomplished other feats in life shine? The world is made up of more regular everyday women than celebrities. Essence is quite shameful and it's only going to get worse.